You have TWO WEEKS to play along - Deadline to enter is Friday, August 3, 2108 at Midnight CST. The winners will be announced on the NND blog the following Monday. Debbie Owens creates a pastel background using acrylic paints. She then water colors Newton and his bouquet of balloons from the Newton's Birthday Balloons stamp set. She applies Glossy Accents to the kitty balloon. She heat embosses the sentiment on vellum. She then adheres everything on a striped background. Such a festive way to celebrate a birthday! 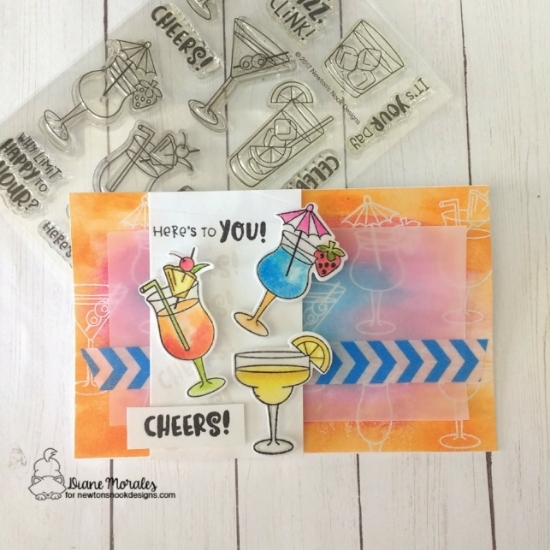 Diane Morales creates this fabulous background by heat embossing the cocktails from the Cocktail Mixer stamp set and then adding Distress ink. 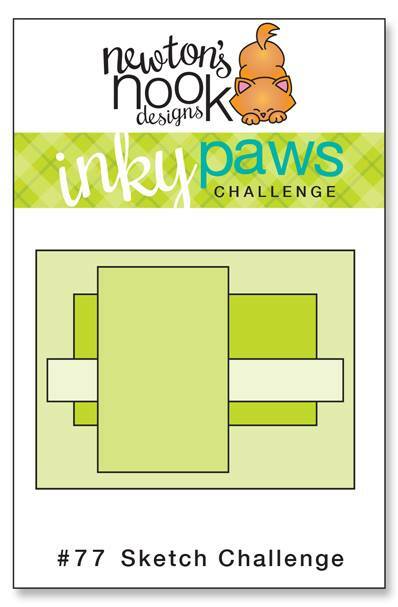 She adheres a vellum rectangle and washi tape to mimic the sketch. Finally she stamps and colors the cocktails and dies cuts them with the coordinating Cocktail Mixer dies. Such a colorful, summery card! 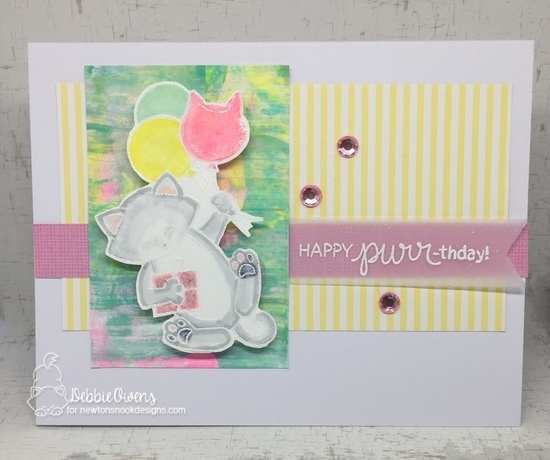 Emily Lauritzen creates this darling card using a clear card base! She expertly colors the trio of onesies from the Loveable Laundry stamp set in reds and yellows. 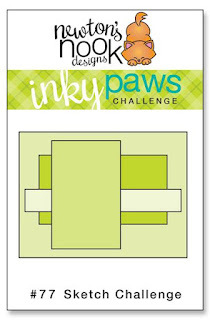 She die cuts the yellow background using the Frames & Flags die set. She combines all of this with an ombre banner and gray and white striped paper to create this delightful card. Sue T. has Winston from the Winston's Lake House totally relaxing and enjoying summer. 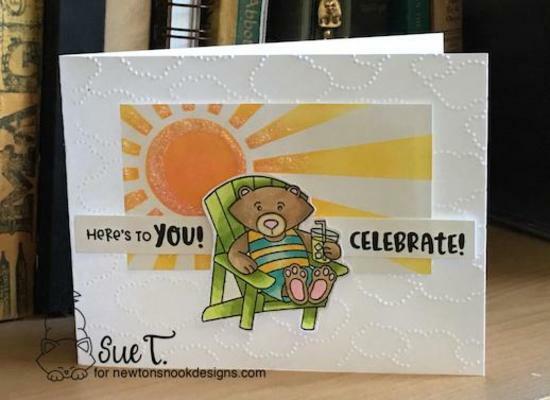 For this summer scene she embosses a cloudy background then creates the sun and rays by using the Sunscape stencil. She then pulls the sentiment from the Cocktail Mixer stamp set. Such a fun way to mix and match NND products! Becky Noelle creates this spectacular background by stenciling the leaves from the Tropical Leaves stencil with texture paste and then masking each leaf to do the ink blending with Distress Oxide ink. 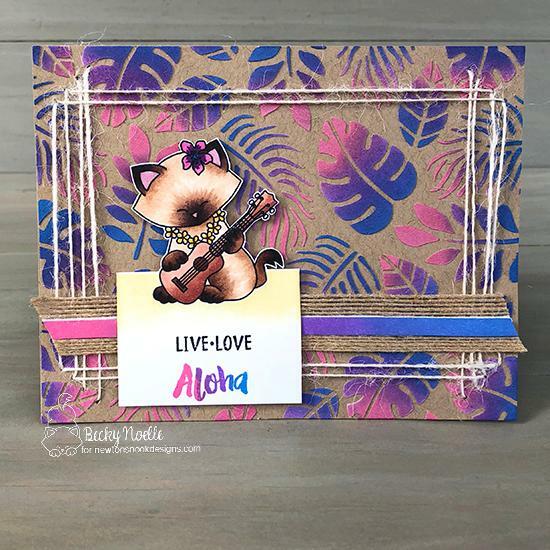 She then stamps and colors this darling feline and sentiment from the Aloha Newton stamp set. She then adds burlap and twine to finish this adorable card! Thank you for the new challenge - waving from Sunny Michigan where the weather is fabulous!